Yes, my personal finance tracking spreadsheet does calculate our net worth. It also calculates another asset-related number that I find more useful: our funded ratio. But the number I pay most attention to is not a measure of our assets. The number I pay most attention to is our annual retirement account contributions. To explain, allow me to share a brief bit of personal history. From age 17-21, I worked in a sales position in which the compensation was purely commission. In that position, some days were good, and others were not so good — and it often had nothing to do with how hard I worked or how smartly I worked. It was just luck. The first year or two in the job felt like a rollercoaster. Some days were crushingly bad. Other days I was riding high. Eventually, I learned that it all averaged out over time, as long as I did the necessary amount of work. And so I shouldn’t be too sad or worried about a particularly bad day. Because the short-term results were significantly out of my control, it was helpful to judge my performance based on effort rather than the results. Doing so allowed me to stay sane. In addition, focusing on the effort (i.e., making sure I worked enough) was in fact the best way to improve results. With regard to investing, the stock market has been shooting upward over the last several years. So of course our stock-heavy, index fund portfolio has been growing rapidly. But that’s not because of anything brilliant we did. Similarly, our portfolio fell by nearly half from late 2008 to early 2009. But that wasn’t because of any mistake we made. We have no control over how the market performs over any particular period. But we do have control over how much we save each year (for the most part, anyway). Sometimes the trajectory of your net worth will be good. Sometimes it will be bad. But focusing on such results a) makes you crazy and b) sometimes leads to faulty conclusions. By focusing on what you have control over, it’s easier to stay level-headed and stay motivated. To be clear, my point here isn’t that the results don’t matter. Results do matter, of course. But improving the inputs that you control is the best way to improve results. And you’ll be mentally healthier along the way. Are Most Investors Better Off with All-In-One Funds? If we’re assuming there’s no difference in original allocation (i.e., the person would start off holding either the LifeStrategy fund or an identical allocation via individual index funds), then the upside of an all-in-one fund is that it’s easier to stick with the allocation plan. That has certainly been my personal experience since switching to a LifeStrategy fund 6 years ago, and I have heard from many people over the last several years who have had similar experiences. Conversely, to date I have never heard from anybody who switched to an all-in-one fund and found it harder to stay the course afterward. Part of this is due to what the reader above mentioned — the fact that an all-in-one fund somewhat camouflages the volatility of the higher-risk holdings by combining them with lower-risk holdings. Part of it is also due to the simple fact that, with an all-in-one fund, you know everything is taken care of, so you don’t sign in to your account as often. And if you aren’t signed in to your account, you’re obviously not making any changes. They can cause inefficiencies to arise when other accounts are involved. For example, all-in-one funds are tax-inefficient if the portfolio includes a taxable brokerage account. Or, if one of the accounts involved is a 401(k) in which there’s only one asset class with a low-cost fund, it may be possible to significantly reduce overall costs by picking that one fund and filling in the rest of the desired allocation elsewhere. Such a plan would be disrupted by the use of an all-in-one fund. But if we change the original question slightly and we remove the assumption that the DIY investor uses the same underlying initial asset allocation, then I think it’s very clear that most people are better served by an all-in-one fund than by a self-created, self-managed portfolio. Many people who build their own portfolios end up with a mess — overlapping funds, dangerously high allocations to a single stock, funds selected purely on 5-year performance figures, etc. Most all-in-one funds are going to be quite a bit better than that. Admittedly I don’t mean for the headline to apply to every reader. But I don’t mean for it to be just “clickbait” either. I genuinely mean that some of you would be better off unsubscribing from this blog/newsletter. That probably requires a bit of an explanation. Most people shouldn’t check their investments very often, because doing so can cause unnecessary stress about short-term fluctuations. What I’m coming to realize, however, is that there’s a group of people who would be well served by discontinuing their intake of even “good” sources of investing information (e.g., this blog, the Bogleheads forum, etc.). Specifically, based on correspondence with readers, I’m coming to realize that there are some people (quite a lot, actually) who find themselves second-guessing their own investment decisions whenever they’re confronted with a conflicting suggestion from a credible source. This personal characteristic combined with frequent intake of investment information can lead to a problematic situation. …then additional reading might be doing more harm than good. (Plus, reading has a cost in that it’s taking up your time.) Of course, the above two points are an evaluation that only you can make. But it’s worth thinking about at least. One of the most important lessons in investing is that there is no “perfect” portfolio, but there are many “perfectly fine” portfolios. Once you are confident that you have a “perfectly fine” portfolio, just stick with the plan and let the portfolio do what it is meant to do. What Other Financial Products Do I Use? I’m happy to discuss it, but it’s not very exciting. As with our retirement savings — the entirety of which is invested in a single mutual fund — the goal isn’t to squeeze out every last dollar of performance. Rather, the goal is simplicity. As regular readers surely know, we use Vanguard for our solo 401(k) plans, Roth IRAs, and traditional IRAs. The REI MasterCard that gives 5% back at REI, 2% on groceries, and 1% on everything else. For tax preparation, I use TurboTax — not because I think it’s necessarily any better than the alternatives, but because it’s what I’m used to using at this point, and I don’t particularly want to invest the time to learn a new piece of software. With regard to most types of insurance (life, auto, liability), my overall approach is simply to buy the cheapest policy that provides the coverage I want, as long as the company’s credit ratings are satisfactory. As far as health insurance, we buy ours on the Affordable Care Act exchange. We’ve moved a lot (from one state to another) over the last several years, and our healthcare needs change from year to year, so our health insurance provider and plan change from one year to another as well. For instance, this year we opted for a plan with a low deductible, as it was pretty likely that I was going to need a few medical tests/procedures that I don’t need in other years. As far as disability insurance, I have a policy through Prudential via the AICPA. Where is the “Sweet Spot” for Passive Investing? Firstly, there’s no sweet spot. Passive investing is a prudent choice across the full spectrum of asset and income levels — as soon as you reach an income/asset level where investing becomes relevant in the first place, that is. 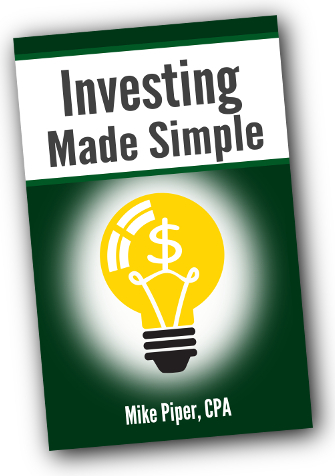 Passive investing makes sense for the new beginner who is just getting started with small amounts, and it makes sense for huge pools of money such as university endowments. What Does Change at Higher Income or Asset Levels? Having said the above, it’s important to note that the implementation of a passive investment philosophy is somewhat different at different income/asset levels. For example, tax-efficient investing strategies are very different for the person whose entire portfolio consists of a $5,000 Roth IRA than for the person with a seven-figure portfolio, most of which is invested in taxable brokerage accounts. And they’re different still for investors whose portfolio size is such that they have to be concerned with the estate tax (with its 2016 exclusion of $5.45 million, and twice that for married couples). But in each case, it’s perfectly prudent to use a passive portfolio of boring index funds. In addition, the asset allocation decision is somewhat different at different levels of assets/income. Specifically, when your total assets are low relative to your living expenses, you have less flexibility with your asset allocation. That is, you cannot afford to have a risky allocation if you may need this money in the near future (i.e., if your retirement savings are currently doubling as an emergency fund). But again, a boring passive portfolio is still a good idea.